MU came out strong, answering the call from SJU by a Try from Connor Shayne and a good conversion and penalty shot from Kyle Schory. Unfortunately, that is where the answers ended. A yeallow card against SJU’s own Ryan Stickon looked to be setting up MU for some success but it was just not so. Whether it was the fitness, the enormous fan support from the SJU Hawk fest and alumni group, or just the discipline on the ball MU never got another opportunity to score again and by the second half of the match they were all but spent and the game had run away without them. SJU could not have asked for a better day. It was senior day and every one of their seniors started the match. It was a bit of a gamble on the part of Coach “Shags” Yarusso. All of the seniors playing could have changed up the game play and set them up for a rough first half. The boys however did not feel that way at all and their experience and discipline working so many different positions over their careers really shone through. Michael Weber, Greg McTiernan, Jimmy Wolfer (C), George Harris, Job Nieman, and Rob Kufczynki all made it over the line and pushed SJU ahead with a first half ending 36-10. The second half of the game fared even better for SJU with their set piece dominating the pitch. 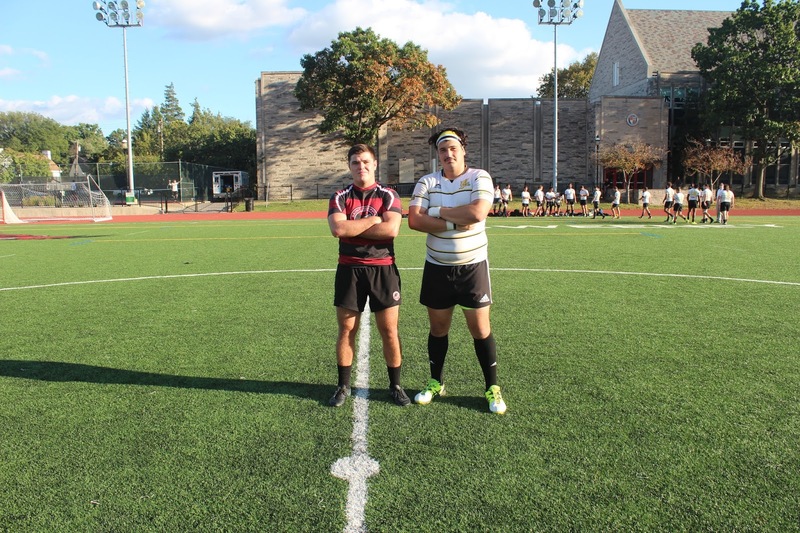 The tries rolled in and by the time the yellow card was issued to MU’s captain, Daniel Falcon, the final nail was in the coffin and the game turned into a scorefest. Big scores riled up the crowd and the seniors were sent off in style. Try scorers: Patrick Ryan, Aram Keshgegian, Chris Curcio (2), Ryan Stickno (2), and Connor McAuliffe (3). Not to discount any of the incredible effort from the golden boot of Jimmy Wolfer (C) with seven conversions, and the great work of Matt Lydon with three. Final Score 95-10 in epic form. Coach Yarusso was happy with result overall he felt, “There is more work that we can do developing some continuity, but our training, discipline, and fitness really shone through. I am just really happy for the seniors, their hard work truly paid off. Millersville fought us the whole time and never quit. They played well.” I think we can all agree with those sentiments. Congrats to SJU for the win and well done to the MU boys and their “never say die” attitude! It was a great start across the conference for the big name teams with Rutgers outscoring Villanova 73-0, Pittsburgh outscoring Lock Haven 57-0, and West Chester over Temple 28-24 with an excellent upset. Next week will bring some closer scores, some bigger rivalries, and take us one step closer to crowning the next KRC XV’s Champions. Check out the game on my YouTube. Search the channel- Brendan Triplett, and stay tuned for weeks to come as we bring the games to you. And of course, as always. Ruck on!